If your household experiences a lot of activity from children, pets, and general busyness, your floors must be able to withstand a wide range of wear and tear. If you are interested in replacing outdated floors with the perfect combination of beauty and functionality, consider laminate flooring. 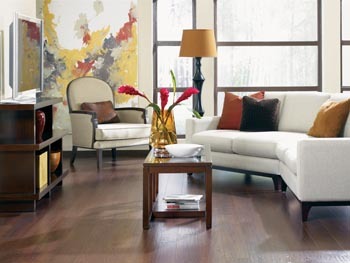 We offer a broad selection of laminate floors that are both visually appealing and highly durable. All you have to do is stop by our convenient showroom location to get started on the shopping process. Here you will find laminate that looks great in every room of the home, including wet areas like the kitchen and bathroom. What distinguishes Flooring America from other flooring stores? We offer clients an impressive selection of laminate in a broad spectrum of hues and designs at an affordable rate. Our flooring company delivers competitive rates by maintaining excellent buying power in the market. This network of buying power allows us to offer you and all other clients quality floors at a price that outshines the competition! Laminate flooring is engineered in four layers, each playing a pivotal role that protects the integrity of the surface. The key to all four layers performing the way you desire and expect is proper installation. Instead of spending time and resources looking for a qualified installer, take advantage of laminate floor installation from our in-house team. Our flooring technicians have the skills and experience to properly install every piece of laminate in a single room or the whole house. With so many types of laminate plank and tile to choose from, selecting the perfect product may seem like a daunting task. Whether you prefer a sleek and modern style, or a traditional and classic look, we carry laminate flooring perfectly suited to your unique tastes. If you are interested in perusing our selection of laminate flooring, stop by our convenient location or call <PHONE> to speak with a member of our team. After purchase, we provide installations for clients throughout the areas of Flower Mound, Dallas, Lewisville, Highland Village, and Grapevine, Texas, as well as the surrounding areas.